Friday April 20, is International Cannabis Day. And the forecast is spliffing. Mark Emery, Canada’s ‘Prince of Pot’ will be speaking at Dublin’s official 420 cannabis rally on the Customs House Quay, Dublin. 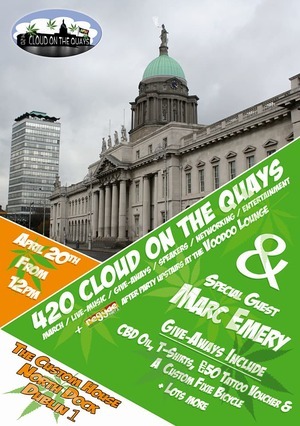 Dublin 420 – A Cloud on the Quay expects over 3,000 supporters and advocates with Live music, talks and street entertainment. Marc has been at the forefront of the Canadian cannabis industry for over 25 years. His business Cannabis Culture, Vancouver has been the hub for activists and information about all things about the plant. Stories and songs about the ‘erb. The Grand Social, Upper Liffey Street, Dublin 1 at 9pm. Posted in Misc and tagged 420, International Cannabis Day at 11:47 am on April 18, 2018 by Bodger. Maybe it’s a marketing gag playing on the stereotype of a groggy stoner, but tomorrow is the 19th. 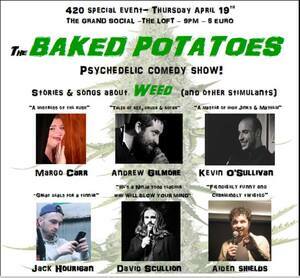 Seanie was telling Fruity O’Faolain at Faithlegge last week to start piling into this cannabis thing. Once it’s legalized there’ll be a killing to be made for those who get in early. by having a bunch of smelly hippies and teenagers smoking hash on the quays? Hash is not what we want legalise. Why would anyone choose hash over weed. You would if you smoked ‘The Crumb’…. best hash on the planet, infinitely better than green. If I wanted to legalise cannabis, this is exactly how I wouldn’t go about it. Hilarious broadsheet header: Free Tomorrow? they’re all free, all the time unless they have to sign on or work a cash gig, or attend court or their shrink. Always felt bad for Emery considering the huge change in North America after he was locked up. He was also fupped over by Canada. Seemingly a good guy by most accounts. Hello, honky tonks! Unai and Mark are the only well-know Emerys I can mention on this thread. Sorry, moderators. Well I’m lost…guess I’ll just Ponder the meaning while doing my nails. 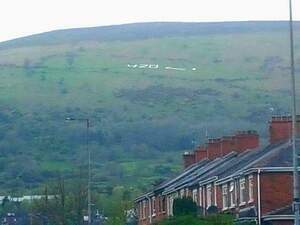 April 20th is Hitler’s B-Day. Ask your Nazi party friend, Greek Prince Phillip..
Care to elaborate on that Rob? It’s not my fault your world view is straight from a children’s history book..
.. looks more like a street party then a protest rally.. sure go check it out… ya might just enjoy the experience!